I’ve been in research for about seven years now. But if you search my name in PubMed, precisely one scientific paper will pop up—a manuscript published this past spring from my current group. I’m pretty far down on the author list, which reflects my contribution relative to my colleagues on this particular paper. While I helped with some of the writing, the data collection and most of the analyses were performed by others. As you snuggle by the fire this holiday season to watch Love Actually, you should know that you’re also viewing the work of a published academic neuroscientist. That’s right—another PubMed search reveals that actor Colin Firth is cited on a 2011 brain imaging study in the journal Current Biology. And it doesn’t take an insecure graduate student like me to accuse Mr. Firth of not pulling all-nighters in the laboratory. Authorship in science is tricky. In some laboratories, it’s a bit of a taboo topic. Ask your average scientist if they’ve witnessed abuses in authorship, and they’ll likely be brimming with stories for you—from people being “gifted” an authorship they don’t truly deserve, to hard-working (often junior) scientists being wrongly shafted by their colleagues. These stories are rarely discussed among labmates, and almost never between junior and senior investigators. And then there are the extremes, like the 2001 Nature paper on the sequencing of the human genome boasting 2,900 authors and the 2012 paper detailing the Higgs boson, which cites a whopping 3,171 co-authors. Where exactly do we draw the line between who has made a meaningful contribution to a project and who is better suited for the “Acknowledgments” section? 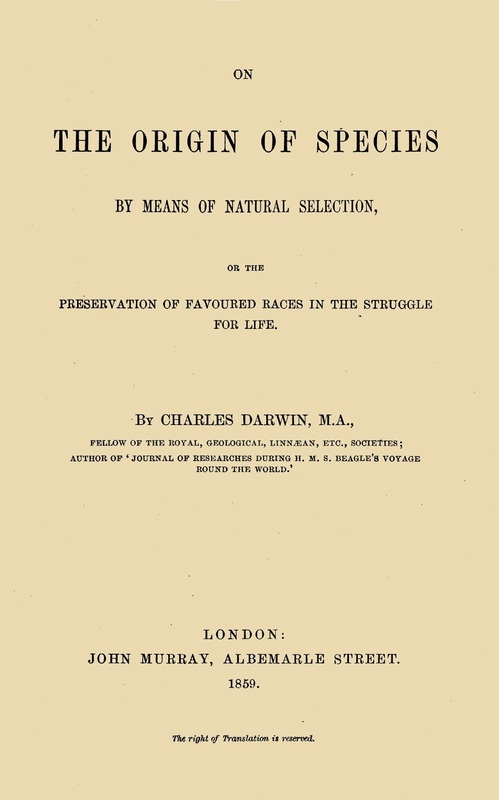 Chuck Darwin knew all about sole authorship. From the late 1600s to the early 1920s, sole authorship on scientific papers was the norm. It wasn’t until the 1950s that a few co-authors began trickling in. By the 1980s, authorship among multiple colleagues and collaborators was standard—and expected. Today, getting one’s name on papers keeps scientists afloat. A scientist’s publication record is proof that they’re an expert in a particular field; the more papers they have out, the more productive they appear. After all, publications are what keep the grant money rolling in. Authorship is a form of scientific currency, and only the rich remain buoyant in today’s “publish or perish” culture. More commonly, individual journals detail their own authorship guidelines, and certain journals are more stringent than others. A journal to which I recently submitted a paper required each co-author to submit a separate form. Among other information, we had to “attest to having provided substantive intellectual contribution” in at least one of the following areas: study design, data collection, data analysis, interpretation of results, and preparation of the manuscript. As another option, many journals allow—and often encourage—authors to include an “Acknowledgments” section to properly cite individuals who do not otherwise meet authorship criteria. 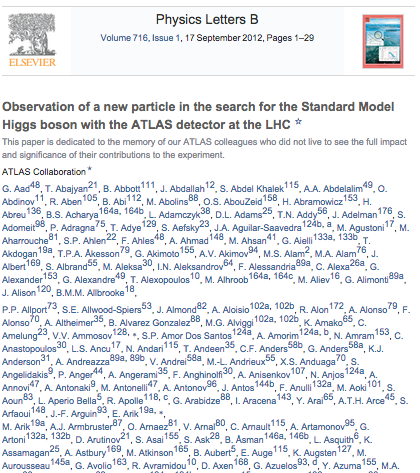 Authors on the Higgs boson paper! Well, just the "A"s.
Unfortunately, these are only guidelines. There is no “law of the land” in scientific authorship, and nothing prevents a person from checking off any or all boxes on such forms. Journal editors receiving a new manuscript for review cannot be certain whether or not a research group has followed these recommendations. And if they could, what can they do about it? A 2005 paper by Larry D. Claxton reported that in chemistry, the average number of publications per investigator has risen from 4.9 articles to 10.8 articles per 2-year period over the past few decades. Twenty chemists in particular managed to be authors on over 32 papers per year, amounting to one new paper every 11.3 days. If one were ethically following proposed authorship guidelines, this record would be simply impossible. Despite having some of the most direct, intimate involvement with data collection, analysis, and writing, graduate students like me are significantly less likely than a postdoc or principal investigator to be cited on a paper. After all, no one knows my name, and I’m nowhere near being established in my field—I’m not exactly an asset to a list of authors quite yet. But scientists, be warned: abuse of authorship can result in a journal retraction. Ivan Oransky and Adam Marcus’ blog Retraction Watch reports on scientific papers that have been pulled from their journals for one reason or another. A quick skim of the “authorship issues” tag discusses retractions due to researchers being denied credit or papers that were submitted without the knowledge of all authors. It’s a wonder that authorship abuse continues despite this constant, looming, and humiliating threat. 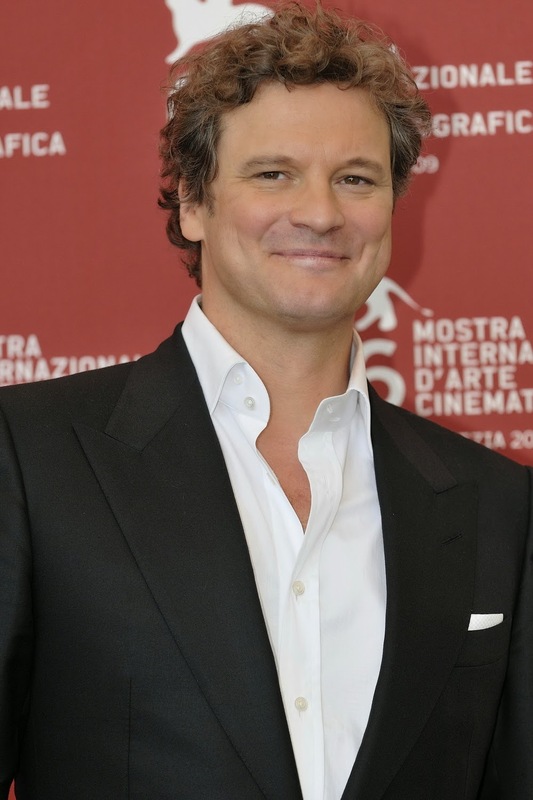 So how is Colin Firth a neuroscientist, anyway? Here’s the lowdown: on December 28, 2010, Colin Firth guest-edited a BBC Radio 4 episode. For his program, he and science correspondent Tom Feilden commissioned University College London professor Geraint Rees to scan the brains of politicians. Firth and Feilden’s hypothesis was that different political leanings would be associated with structural differences in the brain. Conservative Alan Duncan and liberal Stephen Pound participated in the MRI study for the program—the published study represents data from 90 young adults who identified as being on either end of the political spectrum. The study authors reported that conservatism was associated with a larger right amygdala, while being liberal was associated with a larger anterior cingulate. 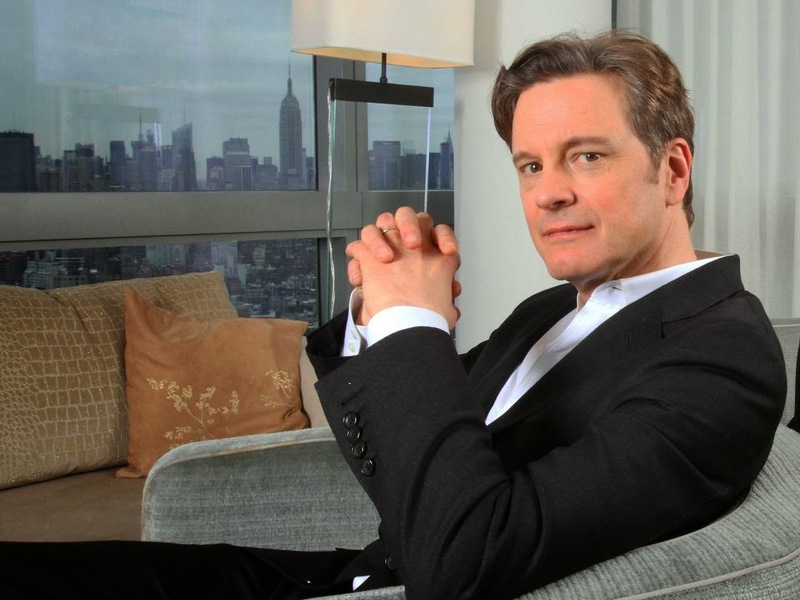 Should Colin Firth have been listed an author? Most would say “no.” Although it makes a great story, an acknowledgment would have been most appropriate in this case. After all, if Mr. Darcy were to potentially co-author a scientific paper with me, I’d make darn sure we spent quality time working hard to perfect the research project together. Lots of quality time.